Humphrey Johnson and Ed Dox from the Maine Association of Sea Kayak Guides and Instructors perform self rescue techniques for the media on May 19, in South Portland, during an event focusing on paddling safety hosted by the U.S. Coast Guard. 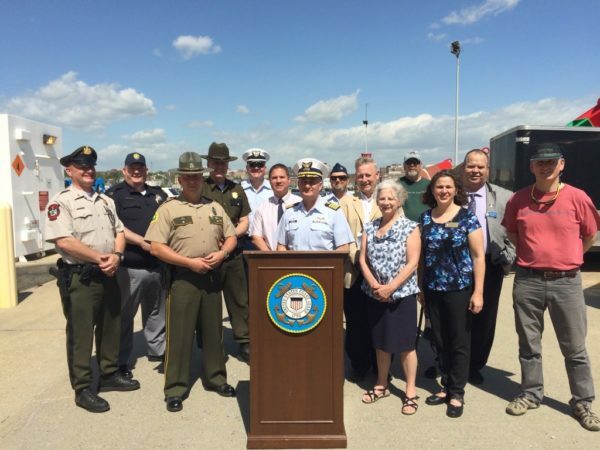 Representatives from the U.S. Coast Guard, the National Weather Service and state boating law administrators from Maine, New Hampshire and Vermont are joined by local officials to show unity in promoting paddlecraft safety on May 19, in South Portland. 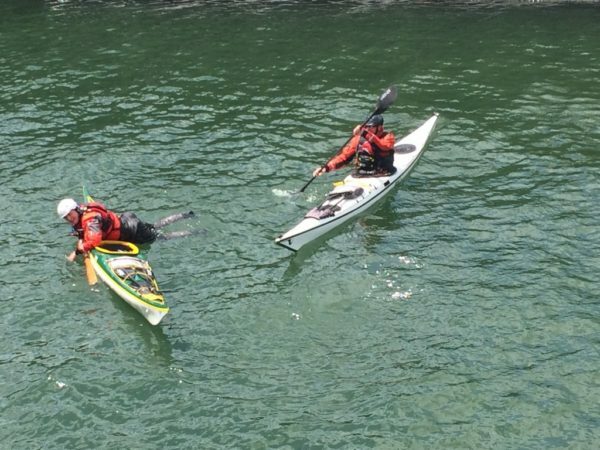 In response to the recent spike in paddlecraft-related fatalities in the Northeast, U.S. Coast Guard units throughout the region are ramping up efforts to educate the public about paddling safety. Working with state officials, local outfitters, boating organizations and Maine guides, the Coast Guard is broadcasting messages about the gear, knowledge and practices required to paddle safely throughout New England. “We need to do everything in our power to decrease the number of preventable paddlecraft-related deaths on our waterways,” Capt. Michael Baroody, Commander of the Coast Guard Sector Northern New England, said recently in a news release. Last year, 28 people died in paddlecraft-related accidents in the Northeast alone, accounting for nearly 60 percent of all recreational boating fatalities in the First Coast Guard District. And more than half of those paddlecraft-related deaths — 17, to be exact — occurred in the Northern New England Sector of the district, which comprises Maine, New Hampshire and Lake Champlain. Nine of the deaths occurred in Maine, seven in New Hampshire and one on Lake Champlain. “No one thinks they’re going to tip their canoe or kayak, but those that do have a hard time swimming in cold water,” Lt. David Bourbeau, chief of the Waterways Management Division for Coast Guard Sector Northern New England, said. During the springtime in Maine, when lakes are newly thawed and rivers rush at full strength, it’s especially important for people to exercise caution while paddling. Already this year, five people have died in paddlecraft-related accidents in the Northern New England Sector, including three in Maine. Among them was a 5-year-old boy. The recent increase in paddlecraft-related fatalities and injuries may have to do with one simple fact: more people are paddling. Approximately 22 million Americans — that’s 7.4 percent of the population — participate in some form of paddling, according to the U.S. Coast Guard Auxiliary. Or you could have a disastrous day in the water. This early in the season, when water temperatures hover between 40 and 50 degrees Fahrenheit, a person can quickly become hypothermic, which hinders a person’s body functions and the ability to think clearly. Dressing in synthetic or wool layers or wearing a wetsuit or drysuit, may prevent this from happening. And wearing a lifejacket will keep you afloat through the initial shock. That’s one reason why the biggest message of paddle safety experts remains: Wear a lifejacket. In more than 80 percent of the recreational boating deaths in the Northeast last year, victims were not wearing lifejackets. In an effort to warn people about the difference between air temperature and water temperature in the northeast, especially along the coast, the National Weather Service has recently launched a new public awareness tool, a “Beach Hazard Statement,” to be issued through news outlets. “It’s basically a warning to beachgoers or people who might be in paddlecrafts of the significant difference between warm weather and cold water temperatures,” Bourbeau said. In addition to being relatively affordable, paddlecrafts don’t require registration or a license to use. Therefore, people can go paddling even if they don’t have much knowledge of the sport or the waterway they’re exploring. And that’s often the case, according to Karen Francouer, Master Maine Guide and owner of the Castine Kayaks, a businesses that specializes in guided kayaking tours and paddling safety and instruction. In Maine, a state nicknamed “Vacationland,” many paddlers out on the water are using kayaks, canoes and paddle boards that they either rented or found at the property they’re renting. “I think one of the biggest problems are people who are renting boats out that are inappropriate,” Francouer said. Different types of paddlecrafts are made for different types of water. For example, a sea kayak is specifically designed to paddle on the ocean and large lake, where paddlers contend with waves, wind and currents. Recreational kayaks, on the other hand, are designed for quiet water, such as ponds and meandering streams. 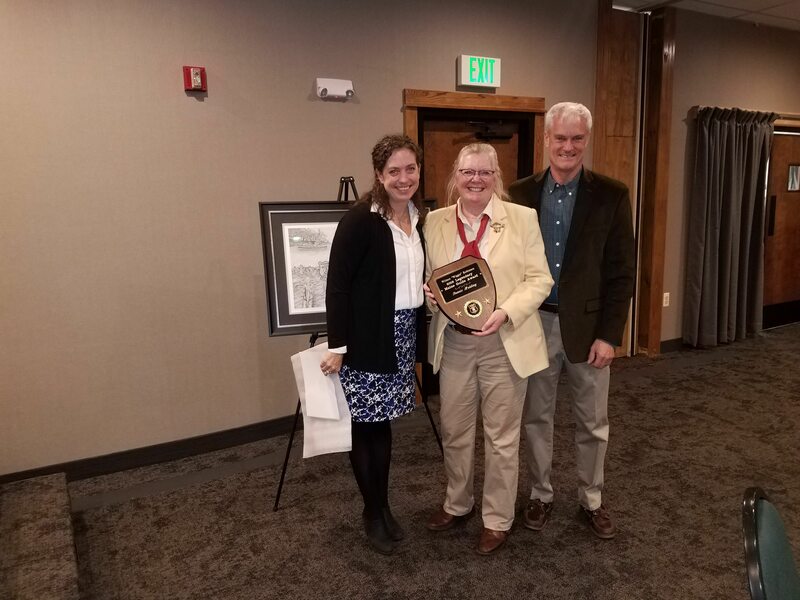 This issue was one of several paddlecraft safety topics discussed earlier this spring at the Sharing Waterways Workshop held at the Southwest Harbor Coast Guard station. At the event, local outfitters, guides and rental business owners gathered with Coast Guard personnel, Acadia National Park staff, and members of the Maine Marine Patrol to talk about ways to educate the public about paddling safety in the coming season. For example, the Coast Guard will be pushing the USGS mobile app, which provides users with the latest safety regulations and navigation rules. The app also allows the user to request emergency assistance, report hazards and pollution while on the water, and file a float plan. Also this summer, Miller is teaming up with Francoeur to record a series of public awareness announcements about paddling safety, to be aired on Saturday mornings on WERU-FM radio station. The Coast Guard will also be working with a number of organizations and businesses to plan paddlecraft safety workshops throughout the season. For example, on June 9 through 11, the Coast Guard will be participating at the L.L.Bean Paddlesports Weekend at the L.L.Bean flagship store in Freeport. The three-day event will include boat demos and a full schedule of paddlesport presentations and classes. An on June 24, Francoeur will lead kayak capsize and rescue demonstrations at Orland River Day. She also offers paddling instruction courses for all skill levels throughout the summer through Castine Kayak.